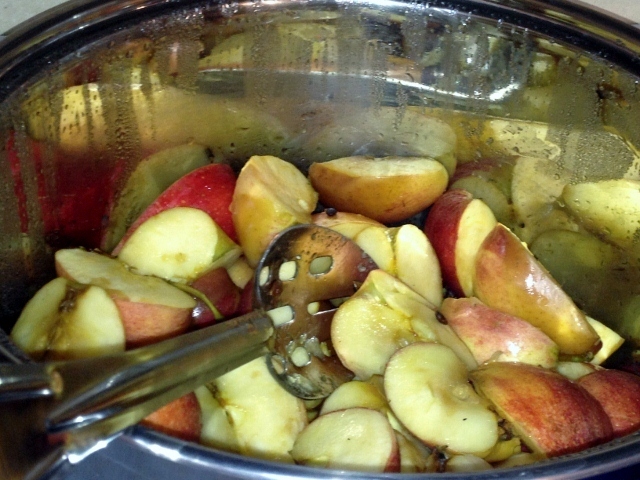 ‘Tis the season for all things apple – apple cider, apple pie, and applesauce. 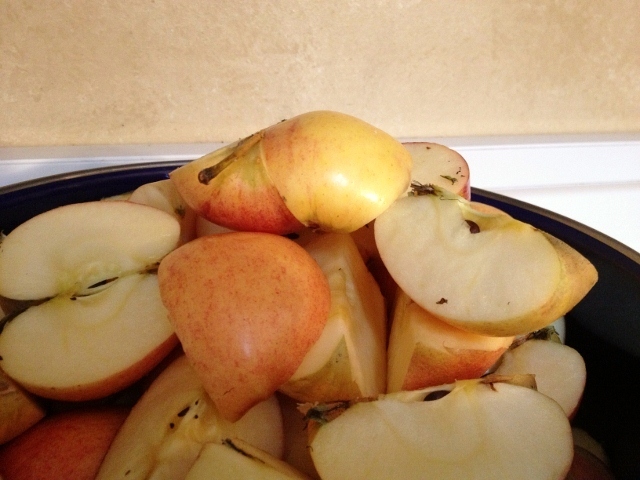 Here is my French Twist on apples. 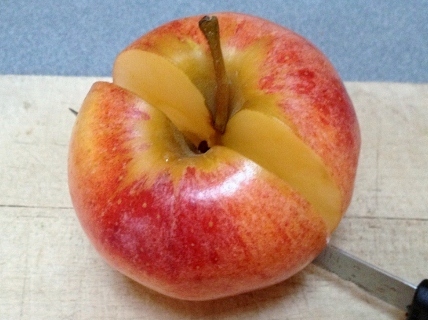 In French, apples are les pommes. Potatoes are les pommes de terre, literally “apples of the earth.” The French translation even makes the potato sound like a lovely vegetable, instead of the tuberous-root-grown-in-the-dirt that it is. Apples of the earth? MMMMmmmmm. 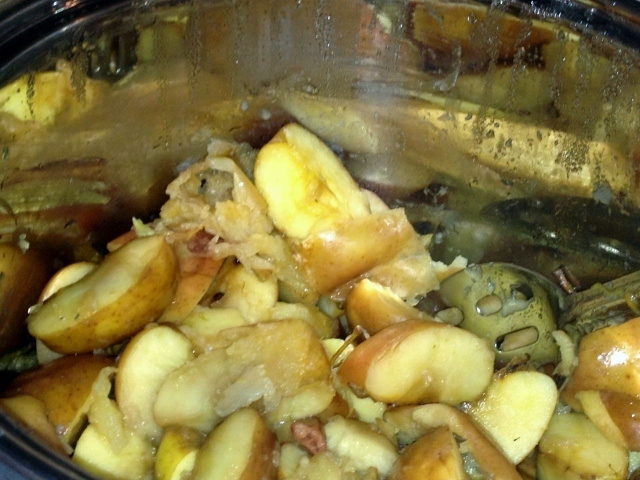 Now, on to the Easy Applesauce Recipe. There is only one ingredient. You guessed it. Apples. You can use any type of apple that you like, but choose one that you like. It’s like cooking with wine. 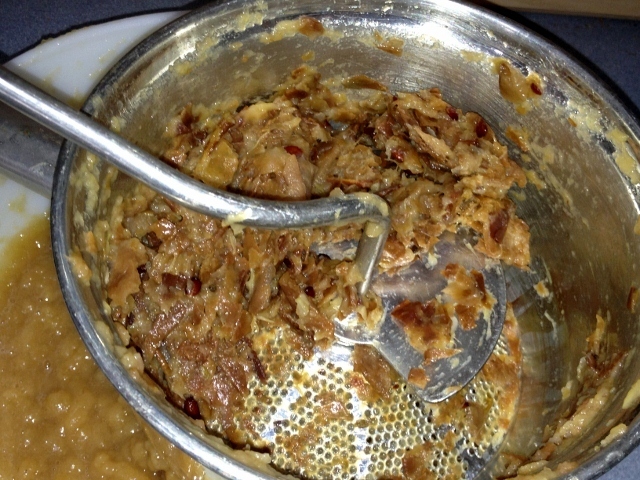 The cooking does not necessarily improve the flavor. 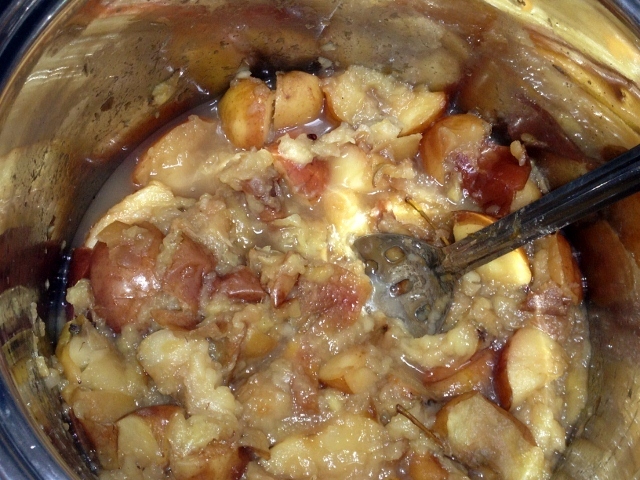 If you don’t care for the taste before you cook the apple, chances are you are not going to like it after it is cooked either. I prefer Galas for applesauce. 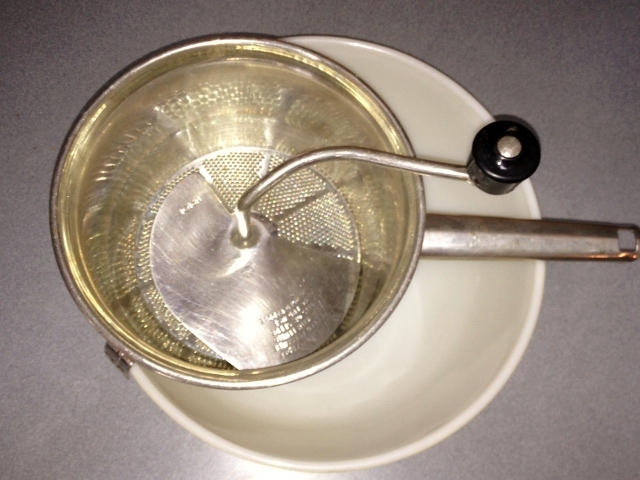 Use as many apples as you like. 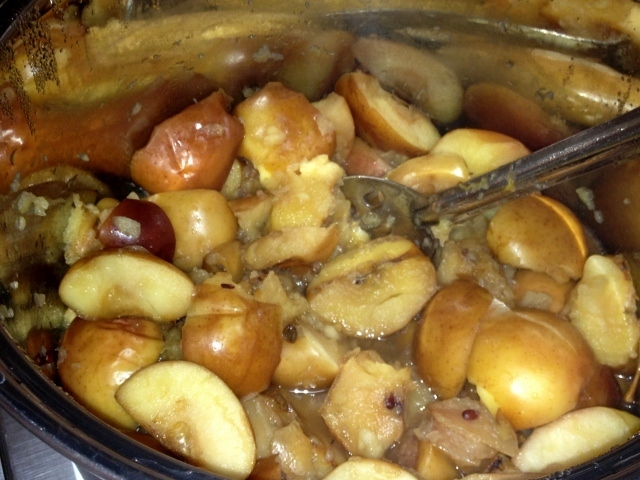 Use a few to make a small bowl of applesauce for dinner. Use a pot full to make a large batch. Cut them in quarters. 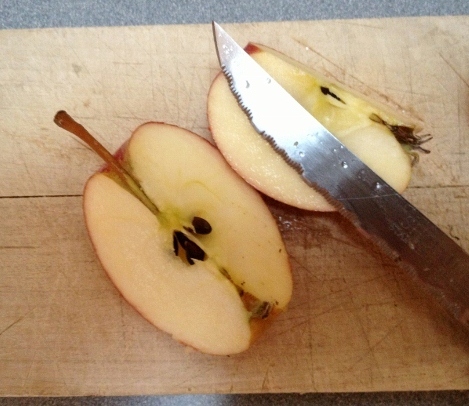 No need to remove peel, stem or seeds. 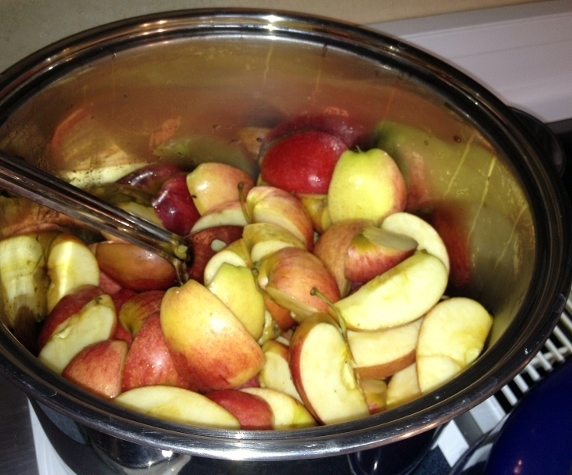 Put the apples in a pot. In the beginning, stir every 10 minutes or so, just to be sure they are not sticking. If they stick, add another pinch of water and lower the heat. Cover and keep simmering. 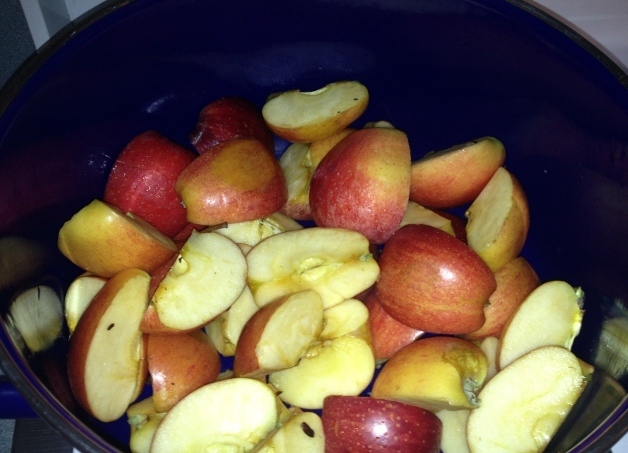 Once the apples release their own juices and there is no danger of the apples sticking to the bottom of the pan, you can turn the heat to low and go take a walk or a nap or read a book. Just come back and check on it and give it a stir every half hour or so. You will want to stay in the kitchen anyway. It will smell divine! The apples will get softer. 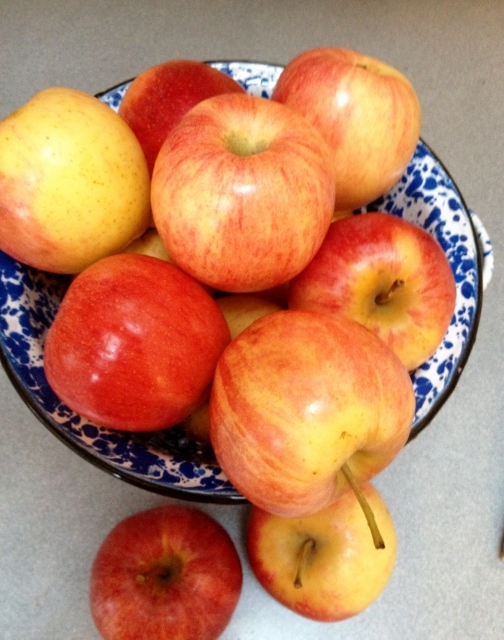 When the apples look like this, they are ready! 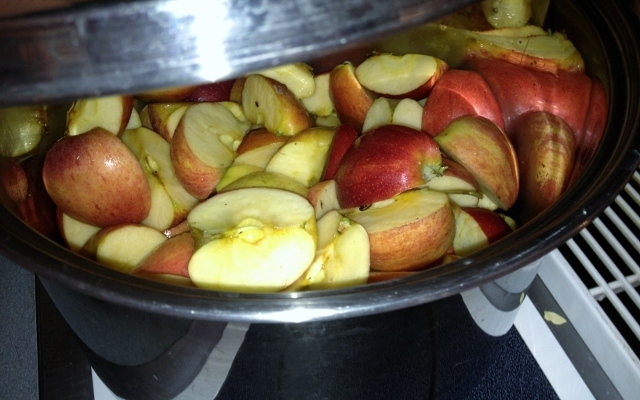 Scoop the cooked apples into the food mill and start churning. This is when having kids comes in handy. 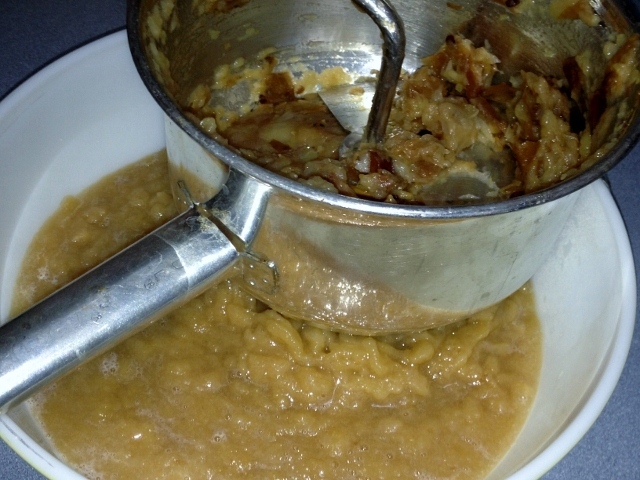 If you don’t have any kids, you may want to consider borrowing one from a neighbor because between the ages of 5 and 9, they think this is fun to turn the handle and watch the applesauce accumulate in the bowl beneath the food mill. By the time they reach the ages of 10 or 11, they have figured out that turning the food mill is work and are not as likely to volunteer to assist. That’s when you break out the story of The Little Red Hen. None of her friends wanted to help plant the seeds, or thresh the wheat, or grind the flour, or mix the dough, but they all wanted to eat the bread. And The Little Red Hen wouldn’t let them have any fresh bread (applesauce) because they refused to help make the bread (applesauce)! Humph! Keep churning and eventually you will be left with the seeds and stems and skins that will not go through the mill. Throw this away and wash the mill immediately. It’s much easier to clean while it’s still moist. And taste it now. 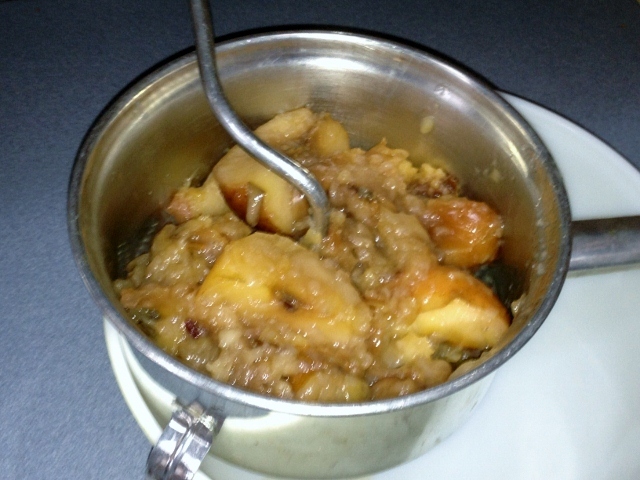 If you have used sweet apples, there is no need to add sugar. You won’t believe how sweet it is. I sometimes stir in a few splashes of vanilla. Or sprinkle with cinnamon. 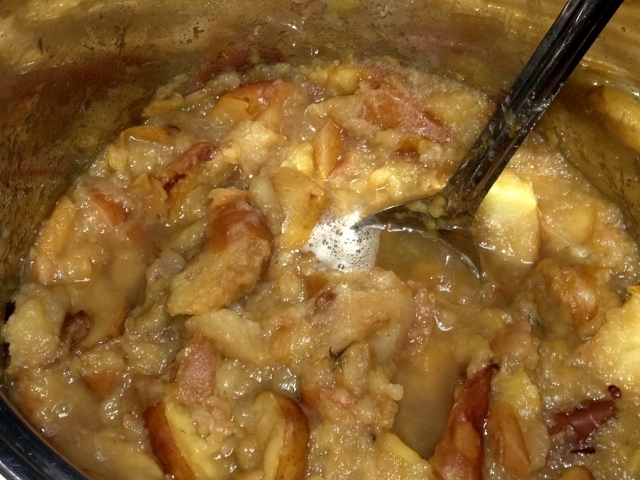 If you used Granny Smiths or some other tart apple, you may want to add sugar, but always taste it first. Et voilà! 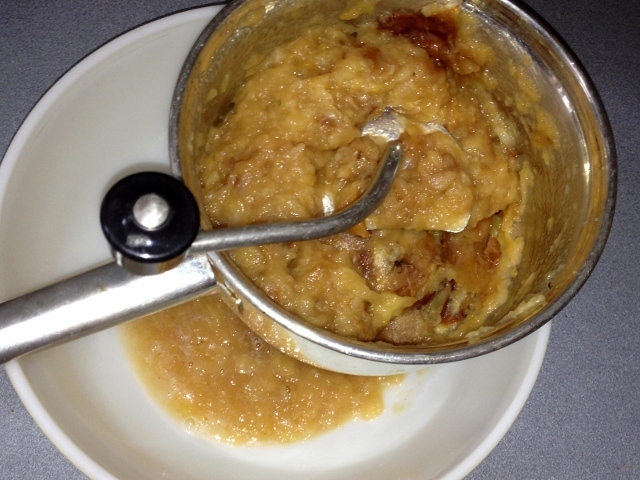 The best applesauce ever! It is so much more delicious than what you buy in the store. 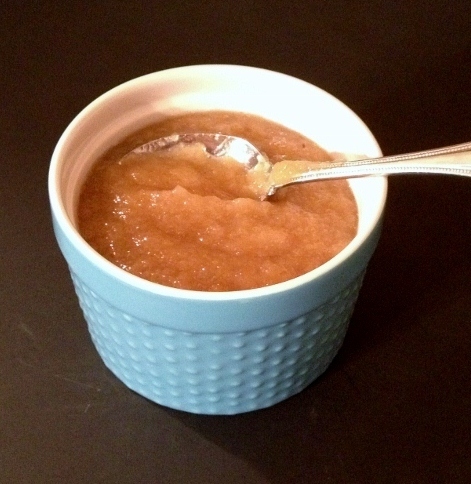 Try adding this applesauce to oatmeal or eat it on toast. Put leftovers in freezer bags or containers to enjoy all winter. It freezes very well. It is as sweet as dessert, but a much healthier version. Just apples. Seulement les pommes! Love this! I will be trying it…just need to get a kid and a food mill.